And so, on a hot, 100-degree late-winter day, I’m on a journey from my home in North Indio to the Mecca Hills Wilderness to look for wildflowers along Box Springs Canyon Road, a state highway connecting Interstate 10 with Hwy 86 that winds its way through the Mecca Hills in a narrow canyon, designated a “non-wilderness” zone. I’ve been seeing a profusion of stunning yellow desert sunflowers and hot pink Desert sand verbena (Abronia villosa) brightening the open desert areas and remaining sand dunes near where I live, springing up seemingly overnight in the past week, so I’m confident I’ll find more flowers today. I can see the Mecca Hills from my front yard, thirty miles away, looming like a conglomerate of tan-colored, hump-backed whales set atop the eastern horizon. 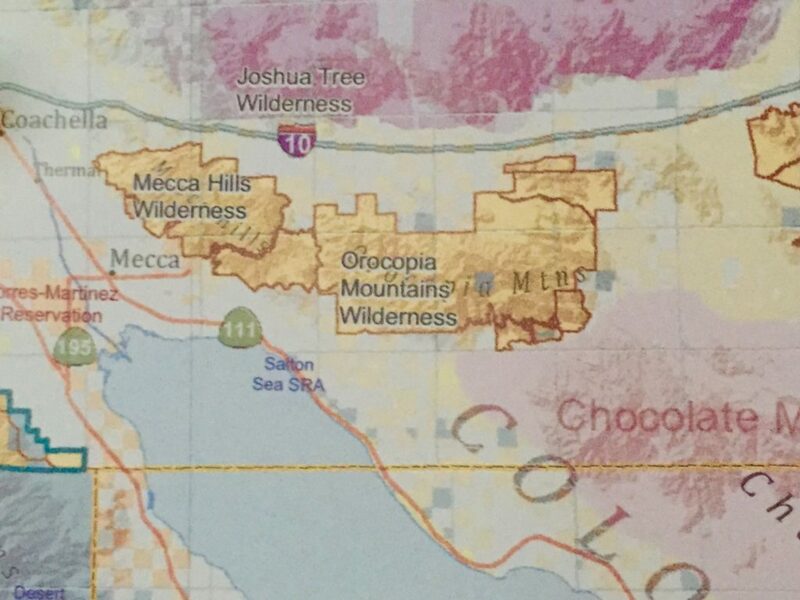 According to the University of Montana’s Wilderness.net website, the geologic formations of the 26,356 acre Mecca Hills Wilderness, are created by the San Andreas Fault, and are among the most unusual sites of their kind in the world. The area is a badlands labyrinth, a natural maze of small, narrow, steep canyons. 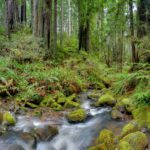 Entire regions are exposed layers of eroded rock, some over 600 million years old. 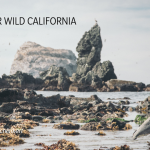 It was designated as wilderness as part of the California Desert Protection Act of 1994, a major conservation milestone that CalWild helped pass. As I drive south from Highway 86, past Fantasy Springs and Spotlight 29 Casinos towards the Salton Sea, I breathe a sigh of relief. 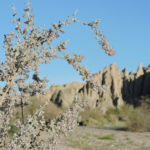 I’ve seen on social media that Anza Borrego State Park and Joshua Tree National Park have been jam-packed with flower-thirsty visitors in the past week or two, but as someone who’s lived in the California deserts nearly my entire life, since 1976, I’ve got a few desert places to go that are still virtually unknown to all but locals and visited almost exclusively (and sparsely) by those who live nearby. I turn east at Avenue 66 towards the town of Mecca, and check my altitude app on my Iphone; I’m at -160 feet below sea level. It still surprises me that so much of this part of the California desert was once covered by Ancient Lake Cahuilla and perhaps was once even connected all the way to the Pacific Ocean; I’m also in awe knowing that the Torres Martinez-Cahuilla people, whose reservation includes part of the Mecca Hills, have been intimately connected with this land, which they have called home for centuries. Another sigh of relief as I head into Box Canyon: not a car on the road but mine. I slow down, relax, and allow the stunning sight of the Mecca Hills up close absorb me. And it doesn’t take long before I see color. I immediately pull to the side of the road, careful to find firm sand so I don’t get stuck. You see, I’ve got a lot of personal history here in the Mecca Hills, memories from my twenty years of living in the Coachella Valley that include many hikes made to Hidden Palms Oasis with my daughter when she was a teenager; my memorable sighting of an October tarantula crawling slowly along the side of Box Canyon Road, to the terror of a friend who was with me that day; a campout in one of the Mecca Hills’ stark side canyons with a group of poets and a big campfire; and driving through here shortly after an historic flash flood, when I marveled at the evidence in debris wrapped at the top of huge ironwood trees showing just how high the water had raced through here from the top of the canyon, just past Shavers Well where the road opens up into the broad Shavers Valley and down to its lower end, in just 7.5 miles. 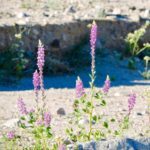 These memories flood me now, as I take in my first wildflower sighting: a small scatter of iridescent purple Arizona lupine mixed with a yellow daisy-like flower, illuminated brightly against the gray mud walls rising dramatically behind them. I take a few photographs with my Canon Coolpix 530, seeking to balance light and shadow, flower and rock and sky. 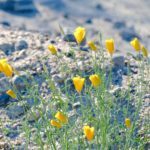 I turn to see a few soft yellow desert poppies on the other side of the wash, some blooming and some yet to blossom, and catch a glimpse of a lone desert lavender bush, limbs almost dropping ad nearly obscured with the heaviness of a profusion of white-lavender flowers. 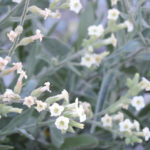 I walk up to the bush, which is surrounded with bees, whose sounds mesmerize me, and bring another memory flood: this is the favorite desert plant of my fiancé, who passed away in 2010, the last year before the drought. The sight of this lonely lavender bush seems to be a sentinel of sorts, reminding me of a love that’s been lost but lives on through the poignancy and urgency of its spring blossoms in this most foreboding of harsh landscapes, a place where it would seem that wildflowers would never be able to exist. 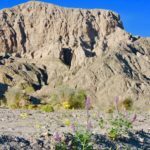 The Mecca Hills are home to bighorn sheep, tarantulas, desert tortoises, and many other desert animals, and serve as an important north-south wilderness corridor between the lower and higher desert elevations and ecological zones. Like the many desert animals making the journey back and forth between these regions, I, too, am finding my way today between the life zones of memories and the present moment; between a dry and brutal landscape and the colorful spring beauty I see before me now. The heat is getting to me, so I find my way back into my car for a blast of air conditioning and chug of the ice water I always bring with me on desert journeys, no matter what time of year. After I cool off, I resume my drive up Box Canyon, but I don’t get very far. 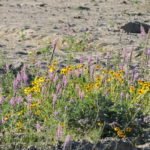 As I round the first wide bend in the wash, the wildflowers are suddenly much more abundant. 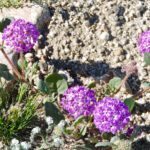 I pull off again, and wait patiently for a semi-truck, which I hear coming down the canyon, to pass me by, and then cross the road to inhale the scent and visual beauty of a broad sandy palette of sand verbena and a craggy rock hillside flourishing with yellow desert dandelions. All I can do is stare, and then, remember to take pictures, as my mind struggles to reconcile the brute landscape with the soft beauty that washes over it, so paradoxically. 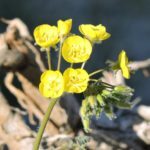 As I look around me, I start to notice other types of flowers mixed in with the bloom: orange globe mallow; a few yellow cups and brown-eyed yellow primrose; a very few ghost-toned sand blazing stars; and white forget-me-nots. As I wander around, I also see a few purple notch-leafed phacelia. It’s hard to leave this scene of such beauty, especially knowing that it’s not likely to last long with temperatures as high as they are; spring is a very short season in this part of the desert, and it’s arrived weeks late, thanks to persistent cooler-than-average temperatures and extra rainfall in February. 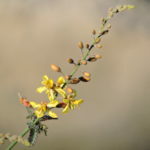 I don’t know when I’ll be back here, but with my busy teaching semester at College of the Desert keeping me pinned to the populated side of the desert, it will probably be after the flowers have dried and been absorbed back into the subtler desert tones. 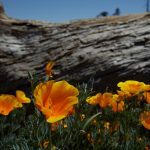 I get back in my car, and continue to drive as slowly as I can uphill through Box Canyon, marveling at the display of wildflowers that only gets richer and hillsides that get suddenly greener and greener the higher in elevation I go. An impatient driver races around me in a Jeep, and although I want this wildflower journey to last forever, I know it can’t. The late afternoon shadows have swallowed most of the canyon and its imposing mud walls, and it won’t be light much longer. As the poet Robert Frost says, although captivated by nature’s beauty on a solo journey, “I have miles to go before I sleep,” and so, although I’m lured and enchanted by the gift of this rare and short-lived wildflower superbloom in the otherworldly glow of the Mecca Hills, I must make my way to Interstate 10, past more flowers and green desert views, and join the late Sunday afternoon freeway hordes heading towards L.A.
I’m one of the lucky ones. 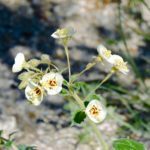 I don’t have too far to go, just 30 miles to my rural desert home right on the wild desert edge, where I’ll be able to catch whiffs of the wildflowers outside my door. 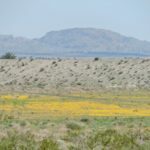 I’ll even be able to see the Mecca Hills Wilderness against a backdrop of yellow desert dandelions in one of the open areas on my way to work in the morning. 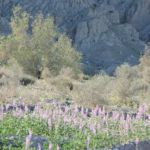 Tonight, I’ll be serenaded by desert wildflowers and dreams of another sweet desert memory that I’ve created today, enriched by this year’s superbloom in the spectacular backyard I call the Mecca Hills. Sources: Colorado Desert Wildflowers by Jon Mark Stewart, 1993. 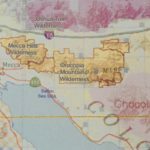 Ruth Nolan, M.F.A., M.A., a former seasonal wildland firefighter for the BLM CA Desert District and U.S. Forest Service and is a desert-based writer and professor at College of the Desert near Palm Springs, CA. She’s the author of the poetry book Ruby Mountain (Finishing Line Press 2016). Her short story, “Palimpsest,” published in LA Fiction: Southland Writing by Southland Writers (Red Hen Press 2016), received an Honorable Mention in Sequestrum Magazine’s 2016 Editor’s Reprint contest and was nominated for a 2016 PEN Robert J. Dau Short Story Prize for Emerging Writers. She’s editor of the critically acclaimed anthology No Place for a Puritan: the Literature of California’s Deserts (Heyday Books, 2009.) 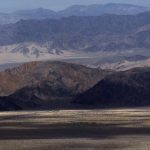 Ruth’s desert-themed writing has also appeared in James Franco Review; Angels Flight LA/Literary West; Rattling Wall; KCET/Artbound Los Angeles; Lumen; Desert Oracle; Women’s Studies Quarterly; News from Native California; Sierra Club Desert Report, The Desert Sun/USA Today and Inlandia Literary Journeys. She may be reached at ruthnolan13@gmail.com and Twitter @ruthnolan.